Now, when it comes to breakfasts I'm not a fancy sorta girl at all. Very low maintenance. Give me some semi-skimmed milk, an incredibly oversized bowl and either cornflakes or weetabix and I'm sold. That is all. 99% of the time I'm strictly no-added-sugar, not because I'm trying to be overly healthy, simply because I love those two aforementioned cereals just the way they are. When in Perth one day, Mum and I had to run a few errands in the city so took the train down a few stops along the Joondalup Line and arrived at Perth Underground station. (Disclaimer: to Londoners, 'underground' either means physically underneath the ground or along an underground line. In this case, Perth Underground fits neither of those labels. It is just a name to differentiate it from nearby Perth station). Walking around, we came across Carillon, a shopping arcade that both my Mum and Grandma worked at a while back. Hunting, yes, hunting for breakfast (we were v. hungry at this point), we found Pancakes at Carillon, the closest thing to our ideal going-out-for-breakfast dish of waffles. Whilst waiting for our order, I drank some of their beautiful cappuccino as I convinced myself I was a young, classy woman, having a hot drink in Winter at a restaurant because I was very fancy and all. Obviously this image disappeared upon discovering the astronomical maple syrup jars, and then staring at it in awe and take photographs. Can we please just appreciate pancakes for a minute. 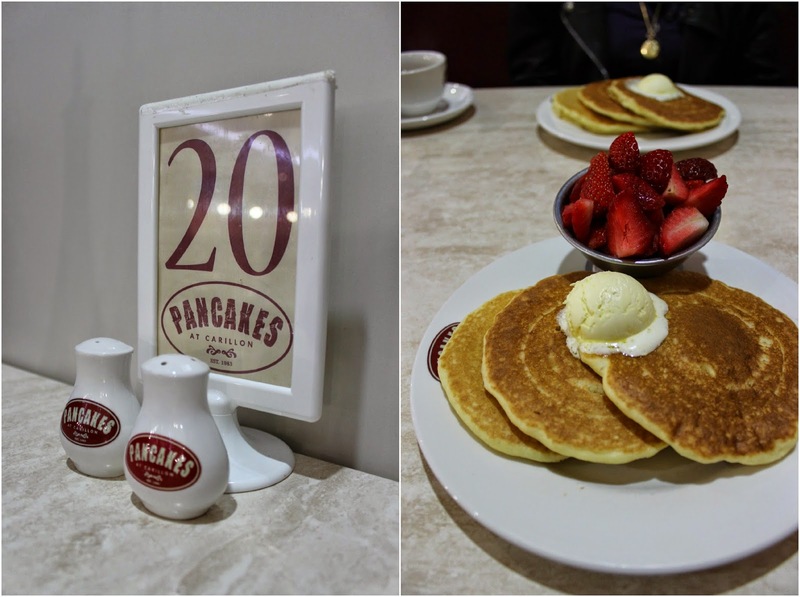 I wrote a post on Pancake Day about how my love for them is unconditional. I have since then discovered the superior beauty that is waffles, however I'm still all about dem pancakes. Served with strawberries and whipped butter, Mum and I were in for a real treat. We ordered 'regular' stacks, consisting of 3 pancakes per serving, however we both felt that we could have downsized to a 'small' and sacrificed one, as we were both a little too full after the meal. Delicious and completely worth it though. You can find the menu for Pancakes at Carillon here. Massive thumbs up for brekky if you're in the city and want something that will really keep you going all morning. One word I heard all the time when in Aus was 'Dome'. Whether it be within a recommendation or swiftly slotted into conversation, Dome seriously was the talk of the town. Having insisted that we go there at one point during our Australian trip, my second cousin Robyn kindly took us there for breakfast on a Sunday morning. 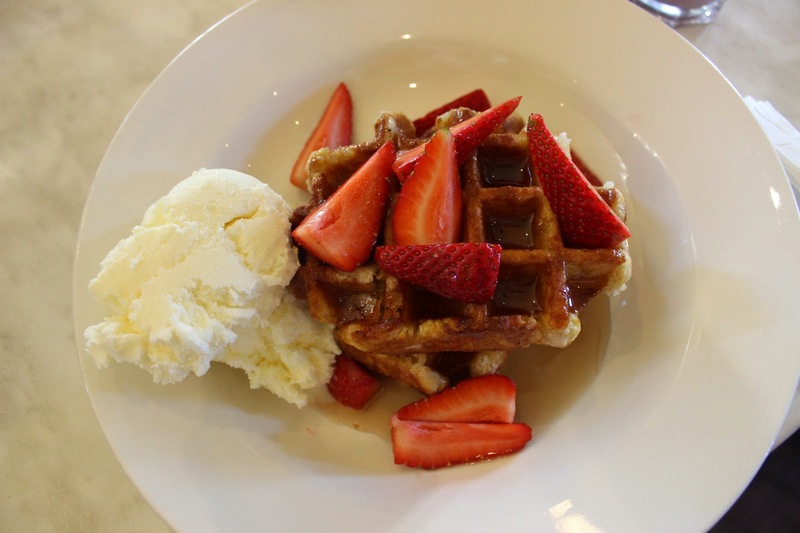 Here they specialise in the one thing Mum and I were yet to find in Perth - waffles. 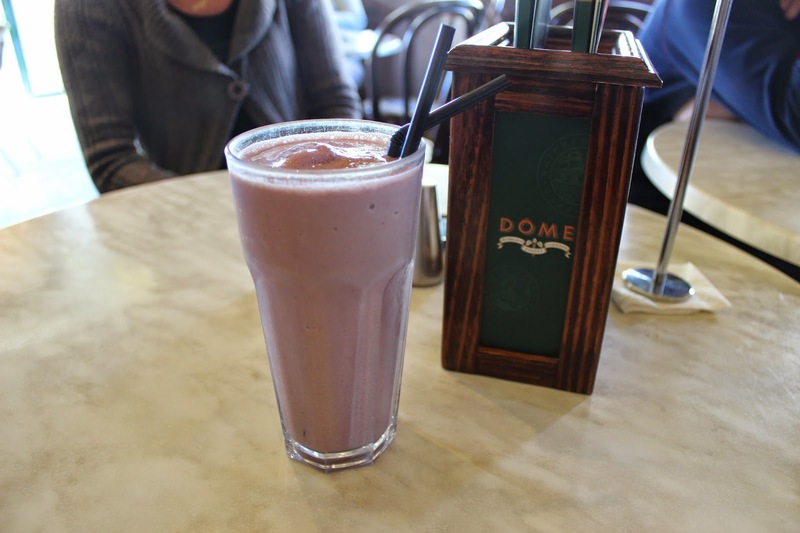 The Berry Bliss smoothie, was, as the name suggests, bliss. Ice cream and berries together are ideal, right?! The waffles marked the point where things got serious. Not only are they physically huge (I struggled eating one and a half of them), you can have your pick of three out of fresh strawberries, sliced banana, maple syrup, vanilla ice cream and fresh whipped cream. I went for the classic ice cream/syrup/strawbs combo...as did all of my family members who also ordered waffles. At $12.95 they're a treat but definitely worth it. If you're not someone who can cope with eating loads in the morning: share it..it's that simple. The portion size would be better that way for a majority of people (unless you're an athlete or something..which I most certainly am not). An even bigger thumbs up goes to Dome! It's incredible. I will always remember the smell of that place. Note to take into consideration though: if you go, don't bother with the airport branches...in comparison to the full-on restaurant branches, they're a bit rubbish. Waffles complete Dome. They are the things that seal the deal. They are worth it. The croissants, however, are not. 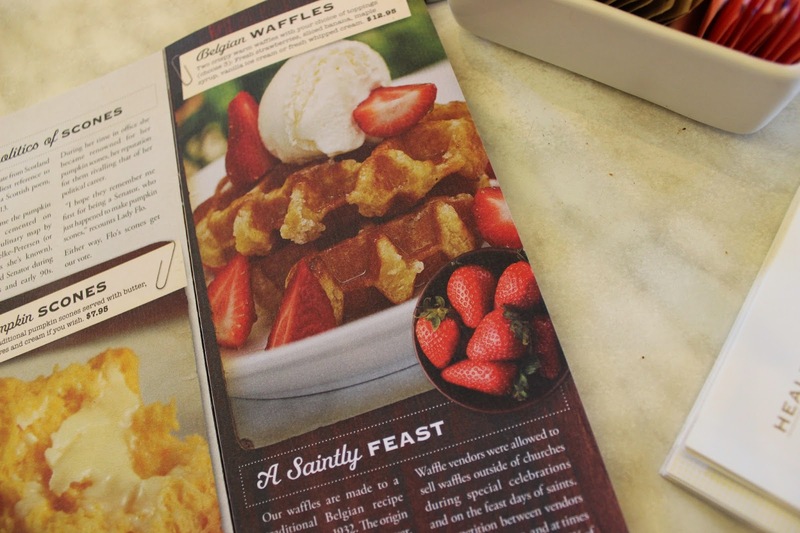 WAFFLES FOR THE WIN EVERYONE. 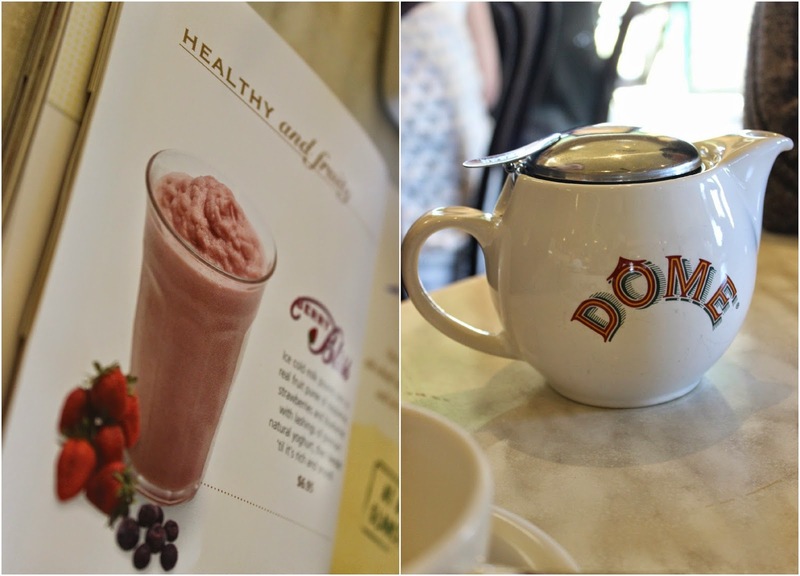 Where are your favourite places for a relatively fancy breakfast? I definitely want try a few breakfast places in London - if any of you have any recommendations, please let me know. Waffles and syrup are a huge selling point for me.